Hitman soap insecticide contains potassium salts of fatty acids that are derived from natural oils. The natural oils used contain fatty acids that are known to be highly active against soft bodied insects and mites. 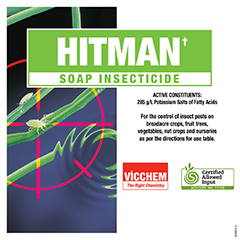 Hitman soap insecticide has no withholding period and is approved by the Biological Farmers of Australia Co-operative use in organic situations. 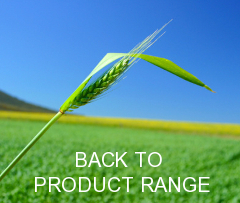 and can be used on a wide variety of outdoor crops, vegetables, fruit trees, pot plants and ornamentals. Plants may be sensitive to Hitman depending upon several factors including; plant vigour, cultivar, growth stage and environmental conditions; the number, frequency, volume and concentration of sprays; other agricultural products used in the spray mix or in prior applications. If unsure of the compatibility or crop safety of Hitman, either by itself or in a tank mix with other agricultural products, please mix up a small amount and test by application to a small area before making up spray tank quantities and using it on a full scale basis. Always follow the directions for use on product labels Enhanced pest control will be provided by Hitman when it is used at the high end of the registered rate (3.0% v/v) When used in Integrated Pest Management Programs it is recommended to use Hitman at the lowest registered rate (1.5% v/v) to minimize harm to beneficial organisms. Hitman may not be suitable for use on delicate ferns, mosses, flowers or plants that are under stress (hot >30°C, humid, moisture deficient) or that have new foliage present. Avoid applying Hitman with Sulfur products or on plants within 3 days of a sulfur application to minimize the potential for sulfur burning. Avoid the use of high volume sprays to minimize the potential for the spray to collect at the base of fruit such as; grape, pear, apple, orange, nectarine etc. Hitman is suitable for application through most types of spray equipment. Do not apply through any type of irrigation system. Manufactured according to a quality management system for consistent and reliable performance.